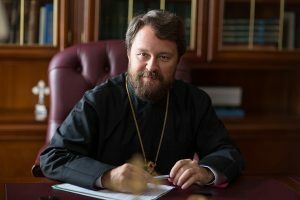 On April 11, 2013, Metropolitan Hilarion of Volokolamsk, head of the Moscow Patriarchate’s department for external church relations, met with the Ambassador of the Islamic Republic of Iran, Seyed Mahmoud Reza, at the DECR. Participating in the meeting were also Deacon Dimitry Safonov, head of the inter-religious contacts office, and Mr. M. Palacio of the DECR secretariat for the far-abroad countries. The Iranian side was represented by Mr. Valizadeh Pilehroud Asghar, first secretary of the Iranian embassy. 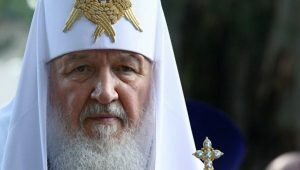 During their talk, the DECR chairman pointed to the high level of relations between the Russian Orthodox Church and the Islamic community in Iran, noting that an important place in the development of these relations belongs to the Joint Russian-Iranian Commission for Dialogue ‘Orthodoxy-Islam’ (established in 1997 at the initiative of Metropolitan Kirill of Smolensk and Kaliningrad, now Patriarch of Moscow and All Russia). His Eminence expressed concern over the growing tension in the world. He gave special attention to numerous facts of persecution and discrimination against Christians in a number of countries in the Middle East and North Africa. 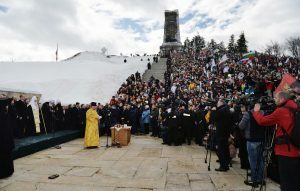 He also drew the attention of his guest to the intensified actions of militant secularism in many countries, noting that in this situation traditional religions should act together for the sake of preserving moral values in society. The Iranian ambassador conveyed to Metropolitan Hilarion the contents of the letter by the General Secretary of the World Assembly on the rapprochement of Islamic mazhabs of Ayatollah Mohammed Ali Tashiri, with whom the DECR chairman met on June 26, 2012, in Moscow.